Some of my distant readers may remember something that us locals will never forget. We lost one of our own last year, Dr. Ed Hudson. He passed due to a freak accident on one of the evening group rides. Dr. Hudson practiced at Lexington Medical Center, who holds a ride every spring, and for many, it is the first organized ride of the year. I’ve attended twice, in 2011 and 2012, and would have attended for the third time last year if not for some nasty weather. I’ve been a proud supporter of the event and the charity, and have done some things locally to help spread the word about the ride. This year they are holding the ride in Dr. Hudson’s honor. You can read about it and register here. I ask that even if you have to drive a ways, please consider participating in this fine event. The roads are terrific, some of the best places to ride in the Columbia area, and it is the least you can do for Dr. Ed’s memory and for our cycing community. Because of my previous support for the ride, and the tribute post I wrote last year, the organizers asked me to say a few words at the event. My first reaction was no since I never met Ed personally. As I thought about it further, I gave it more consideration, and finally agreed. I even wrote a speech. Unfortunately my surgery recovery is taking a little longer than I expected, so I will not be able to attend or speak. Instead I’ve asked them to reach out to some who were closer to Dr. Hudson. Since I wrote the speech, I’ll share most of it here. I’m not one to get emotional, but I got choked up writing it. Be warned. Even though the charity this year is Colon Cancer, the theme is something that affects both Lexington Medical Center and the cycling community at large. As some of you know, we lost one of our own last year. Dr. Ed Hudson was an excellent doctor at LMC and he was part of the cycling community. Apart from a handful of emails, I didn’t know Ed personally, but I did have a similar bond with him. 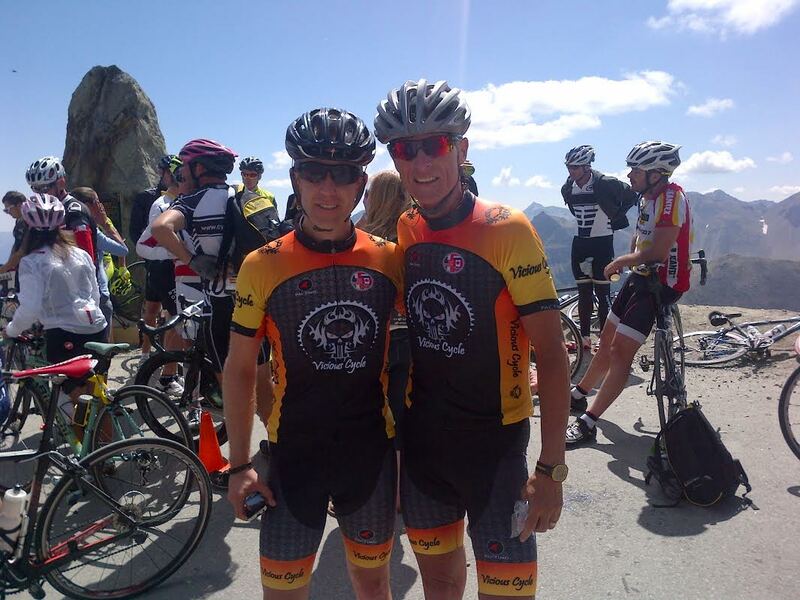 We were both training for the Haute Route, arguably the toughest amateur cycling event in the world. It was a seven-day extravaganza beginning in Geneva, going through the French Alps, hitting a lot of high points along the way, and ending at Nice, France, along the Riviera coastline. Neither of us were able to ride last year. I had to bow out due to a serious injury, which I had surgery to correct earlier this year, but that is nothing compared to my teammate. We lost Dr. Hudson during one of our evening social group rides. It was a terrible, rare and unfortunate accident, and even though nothing compares to how this tragedy impacted Dr. Hudson’s family and friends, it also affected the entire Columbia cycling community. Many of our riders witnessed the trauma of his passing. Whether they knew him personally or not, he was one of us. My connection is because I wrote a tribute on my blog. My blog has a small following and usually I’ll get a handful of readers, but for this one, it spread like wildfire across the Internet. For many who read it, it was a catharsis. Even though I simply wrote the post, I heard from many who were personally affected as they tried to resolve this horrible tragedy. Many left comments while others sent emails, which to this date I haven’t shared publicly. All of them were moving. I felt like I knew him, and that he was both a great man and doctor. There was one email that really got to me. It was from a patient whose life Dr. Hudson had saved not long before his passing. She just could not reconcile how his healing touch had given her life, yet his was taken by a sheer accident. I was not able to ride in the Haute Route last year due to my own injury, but the team went ahead, and had the time of their lives. Many were good friends of Dr. Hudson, including Chris McCarty a co-worker at LMC, the Vork Cycling Team, and Brian Curran of Outspokin’ Bicycles. The team rode in Ed’s memory, wearing bracelets in his honor, and cherished every moment of the ride, from climbing high mountain passes to enjoying a camaraderie with people from all over the globe, all with the same passions and goals. Ed was one of these people. Robert and Gerry wearing Dr. Ed bracelets on a French Summit. For many of you, this is your first charity ride of the year, and I hope you are enthusiastic to ride for this cause and in Dr. Ed’s memory. Hopefully he is somewhere out there with us, in spirit. He would want us to enjoy ourselves, to have fun and ride hard. Today we ride for Ed. This entry was posted on Sunday, March 9th, 2014 at 4:31 pm	and posted in Rides. You can follow any responses to this entry through the RSS 2.0 feed.